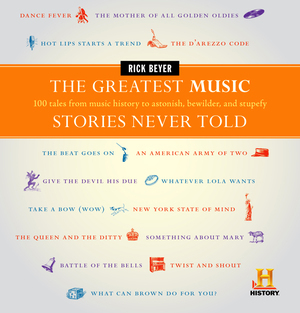 For music lovers and history buffs alike: a collection of tantalizing tales from music history to astonish, bewilder, and stupefy. Learn how hit song was born in a history class, another in a mayoral campaign, and a third was dashed off in a fit of anger at actor Robert De Niro. Meet the monk behind Do-Re-Mi; the orchestra leader killed by his own conducting; the aviation pioneer who created Muzak; and the prisoner who literally sang himself out of jail. Then there’s the most important person in rock ‘n’ roll history—chances are you’ve never heard of him! If you’re looking for firsts, this book has got ‘em! America’s first recording star and music video—both from the 1890’s. Beatlemania? That was nothing compared to the Lisztomania that swept Europe 150 years earlier. The first jazz musician, first radio jingle, and the first singing telegram—sung by an operator named Lucille Lipps...it's all here. • The ballet premiere that sparked a full scale riot. • The musical instrument created by Ben Franklin reputed both to drive people insane. •Waltz King Johann Strauss hired thugs to hinder the career of another composer—his son! Click here for the internet companion to The Greatest Music Stories Never Told.